The foundation of Jah Works is based on a love and respect for Jamaican music and culture. It is this sentiment which gave birth to Jah Works and has become the thread which has kept them together for 11 years and counting. While their music is clearly more ?reggae? than any other style, as US natives they've always added their own flavor to the mix. Jah Works' earliest musical overtures began in Belgium where a few of it's members performed with acoustic guitars in the local bars and street corners while studying abroad. Jah Works' earliest musical overtures began in Belgium where a few of it's members performed with acoustic guitars in the local bars and street corners while studying abroad. It was there that they dreamed of putting together a reggae outfit and naming it after a little known reggae song by The Gladiators called ?Jah Works?. Upon their return to the States in 1993, they did just that. From the beginning, the band immersed themselves in reggae 24-7. In fact, for many of the members, they learned their instruments by learning to play reggae. The band wasted no time. Only one month after the final Jah Works lineup was established, they took to the studio. That initial spark of energy was captured in 1994's Feast or Famine. It became an instant local hit and starting a priceless word-of-mouth buzz in the Baltimore/DC area. In 1996, they had the opportunity to work with famed reggae and dub engineer Scientist on their second release Send the Rain. 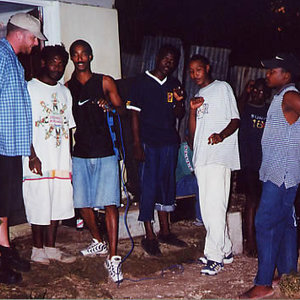 In 1998, they refined their reggae skills once more on Taking Off Tomorrow with renowned reggae engineer Jim Fox at Lion & Fox Studios. Each year the band built upon the foundation of the previous one. Jah Works takes pride in their ability to play many styles. While their first love is for roots-reggae, they also play dancehall. At a live show, it's not uncommon to hear original lyrics over a hip-hop rhythm either. Switching and combining styles has given the band a unique appeal amongst reggae listeners and non-reggae listeners alike. The group has a remarkable list of achievements, none of which have been at the hands of a single record company, management team, or distribution deal. They've produced, funded and released six independent releases, including 2001's acclaimed ?Bassmentality?, for a total of over 70,000 units, all sold from a merchandise table. They average 200-250 shows per year, domestically and internationally, and have shared stages with a host of national/international acts including N.E.R.D., Damien Marley, UB40, Ben Harper, Buju Banton, Burning Spear and many, many more. In 2002, the band was accepted as a member of AFE (Armed Forces Entertainment) and was sent on their first tour entertaining troops at Thule AFB in northwest Greenland. In the fall of 2004, they embarked on their second AFE tour, this time for 6 weeks in the Pacific (Hawaii, The Marshall Islands, Guam, South Korea, Japan, Singapore and Diego Garcia). In 2003, the band fulfilled their dream of playing for European audiences with a two week tour in Holland. The eight show tour concluded with two performances at High Times week long annual festival, ?The Cannabis Cup', held at Amsterdam's premier Melkweg club. Jah Works has also made an annual pilgrimage out of their tours to Jamaica (4 years in a row). The trip exposes the band to both Jamaicans and tourists from around the globe and fuels the fire of inspiration that started the band. So what's in the near future for Jah Works? In an effort to bridge the gap between the recording and the creative processes, the band recently built Riddim House Studios. Nowadays, the focus is there. "Hard to Find", due out in September 2005 is the 1st release from the studio and the 7th Jah Works release to date. The album is, in many ways, a return to the heartical, rootical sound of years past. At a time when elements of reggae and dancehall music pepper the pop charts, Jah Works is primed for national and international success. Until then, Jah Works will continue to narrow the gap between their independent success and wider, national and international exposure.